Did you get a tattoo on a dare? Is your tattoo a permanent reminder of a temporary feeling? Or does your tattoo not look as attractive as it once was? You are not alone. You do not have to live with it anymore. Our new enlighten laser tattoo removal device, allows our physicians to treat and remove unwanted tattoos more effectively and faster. Laser tattoo removal is the process of using laser light to break up the ink in a tattoo so that your body will absorb it naturally over time. After several weeks you will see your tattoo fading away. Tattoo artists recommend this treatment when a client wants a new tattoo to cover up an old one. By decreasing the amount of pigment it allows the artist a cleaner slate to re-create. 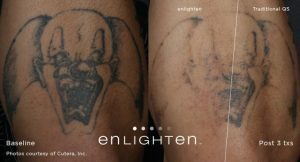 The Enlighten differs from other tattoo lasers with its short and high power picosecond laser pulses which effectively and quickly break down the ink particles. Picosecond laser pulses have been shown to remove tattoos more completely and in fewer treatment sessions than traditional lasers. Depending on the composition, depth, color, and type of ink, size and skin type, several treatments may be necessary to remove the tattoo. There are some cases where all the ink may not be fully removed since some ink colors are more difficult to clear than others. The level of discomfort during the procedure does vary. Clients have compared the procedure to multiple rubber band snaps against the skin. Sometimes topical or local anesthetics may be used to minimize discomfort but results may not be as successful if anesthetics were not used. Post-treatment you may experience redness and swelling but these are temporary. You can return to regular activities immediately. Call 302-633-7550 to schedule a consultation with one of our dermatologists to get rid of your unwanted tattoo.